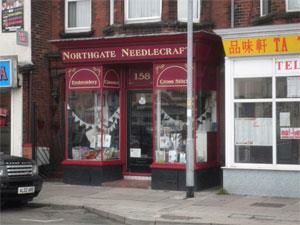 Northgate Needlecraft01493 843604work Shop - Arts & CraftNorthgate Needlecraft, Great Yarmouth, specialising in hard-to-find needlework supplies and the more unusual accessories and gifts for the needleworker. With a fantastic range and craft courses also available. On arrival in Great Yarmouth proceed towards the Fullers Hill roundabout keeping to the left lane and proceed straight ahead at the roundabout then taking the first left turn onto Northgate Street at the traffic lights. Proceed straight ahead at the first mini-roundabout, Northgate Needlecraft is located a short distance along on the right hand side.